Is wild food the new pork belly? My Google alert for "foraging" dings nearly every day with a fresh article on the joys of finding and cooking wild edibles. The New Yorker jumped on the bandwagon recently in their annual food issue with a piece by Jane Kramer in which she forages her way across Europe. The last 18 months have seen the publication of foraging guide books by my pal Hank Shaw with Hunt, Gather, Cook (reviewed here) and Sam Thayer's Nature's Garden (reviewed here); a memoir, The Feast Nearby, by Robin Mather; and Connie Green's cookbook The Wild Table. Is any of this ink actually getting people into the outdoors to interact with their landscape and maybe find a bit of dinner? It's hard to know. There's a learning curve, after all, which is a hurdle in an era of instant gratification and short attention spans. Certainly there is no single resource that can put you on the trail to wild harvesting. Some of the books out there, such as Thayer's, are broad field guides that will only be partly useful in any given region; others, such as Shaw's, are part field guide and part inspiration to give you a kick in the pants; the recipe books mostly work in the kitchen; and the memoirs are strictly food for thought. Would-be foragers who I've met over the years seem most intimidated by issues of identification and processing. Enter John Kallas and his new "Wild Food Adventure Series." 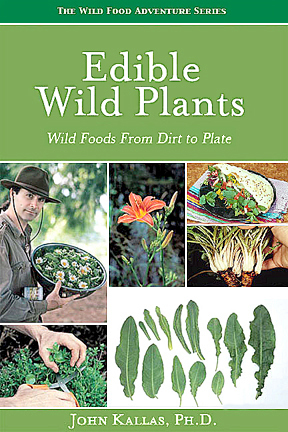 His first volume in what promises to be a collection of related titles is Edible Wild Plants: Wild Foods from Dirt to Plate. Newbies looking for a single resource to get started will be well served by this jam-packed book. It's extremely detailed yet limited in scope. The book only covers a handful of plant species that are common throughout most of North America. More advanced foragers might be put off (only 20 species?) but beginners will be thankful for the depth that replaces breadth. Kallas spotlights those ubiquitous globetrotting wild edibles common to backyard, field margin, abandoned lot, and even sidewalk crack: the weeds. And not even all the usual weeds. Stinging nettles, for instance, don't make the cut. Kallas does cover other common weeds, from lambsquarters (called wild spinach here) to purslane, and wintercress to shepherd's purse. These are truly omnipresent plants that should be on every forager's menu. Many of these species will be familiar right away while others might trigger a memory of this or that unidentified weed that landed in your compost. Thumbing through these pages you might have the sudden realization that the giant spiny thing growing from your neighbor's planting strip is a sow thistle—a highly nutritious plant that, when "managed appropriately," can be used in any preparation calling for collard greens. Edible Wild Plants is divided into four categories that set expectations for taste: mild foundation greens (e.g., chickweed, mallow), tart greens (docks and sorrels), pungent greens (mustards), and bitter greens (dandelions, nipplewort). Entries for each species are detailed, including notes on identification, nutrition, and lifecycle. There are sub-sections for the different anatomical parts of the plant at various stages of life cycle: roots, sprouts, leaves, stems, buds, flowers, and seeds. Each stage of growth is described. Photos accompany all these stages and parts. There are additional sections on harvesting, processing, and cooking, with recipes. The entry on field mustard, for example, is more than 20 pages and includes instructions on harvesting both the vegetable-like flower buds and the seeds used for making the condiment mustard. There are even range maps. I'm often asked about the sustainability of foraging. Obviously, if everyone went clamming tomorrow, the shellfish beds would be quickly depleted. But weeds are another story. The planet would be no worse off today if every American harvested weeds for the table this past Thanksgiving. This makes Kallas's introductory guide book a healthy addition to any forager's library. From my experience teaching about medicinal plants I would say that a very small percentage do anything with what they learn in workshops or classes. I would usually focus first on the plants that were in the yard and they are mostly weeds such as burdock, dandelion, wild lettuce, chickweed and plantain. When I did follow up I would find almost none of the participants were using the knowledge. Checking with other herbalists around the country they too say the same thing. I think it comes down to this: if you are really interested you will get out there and do it yourself. There is so much information available on the web and in books that you don't need to take a class. If you are uncomfortable in the natural world then you just won't do it. Strange but true. Mike - That's unfortunate. I haven't conducted much followup with participants in my own classes, though I've heard from a few (especially in the shellfish classes) who have put the knowledge to work. Bottom line is that people need to get outside more and interact with the natural world, whether it involves foraging or not. Mike, that is unfortunate indeed. As a teacher of mushroom foraging, I have had much more encouraging results so far. You are right that there is abundant information available on the web and in books; my blog, The Mushroom Forager, is an example of an online resource that has helped steer people towards rewarding foraged meals. However, many beginning foragers are afraid to take the leap to actually eating a wild plant or mushroom without having a more experienced guide there in person the first couple times to confirm ID. Perhaps this is particularly true with mushrooms given our mycophobic cultural orientation. During the foraging season, I receive emails almost every day from former students sharing their wild finds with me. Many of these students never had the confidence to eat a wild mushroom before taking one of my workshops, and now they have caught the bug and are able to pursue foraging more independently. At my most recent workshop, a student who had never foraged before called me on the ride home, elated that he had already stumbled upon a big patch of shaggy manes! After sending me a photo to confirm ID, he enjoyed his "little treasures" that evening and proudly posted photos on The Mushroom Forager's Facebook wall. He was already was an avid reader of my blog before the workshop, but it wasn't until taking a workshop that he felt comfortable taking a bite of a wild mushroom. As for those who are simply "uncomfortable in the natural world," I would argue that they have the most of all to gain from the foraging experience. Even if they are still afraid to eat wild foods on their own after a workshop, hopefully the experience of foraging alone will be a good first step towards raising their comfort level in nature and deepening their understanding of the bounty nature has to offer. Certainly there are a number of reasons that people aren't out foraging in droves. Limited time and loss of interest come to mind. But perhaps one reason workshop-goers do not put new knowledge to use is that they have not had enough practice to master a skill. Even experiential workshops where workshop-goers participate in identifying and preparing may only introduce a skill. If this is the case, novices are right to be hesitant. Also, for students to be truly competent,instructors could include a test of participants' knowledge. If I had passed a rigorous test of my identification, harvesting, and preparation skills, I would feel greater confidence that I could go out and gather safely. Unfortunately, most participants are averse to the idea of being tested, and therefore presenters are often unlikely to include a test. I, for one, would seek out a class that gave me multiple rounds of practice and a clear measure of how ready I was to take my new skills to the woods, swamp, or shore.